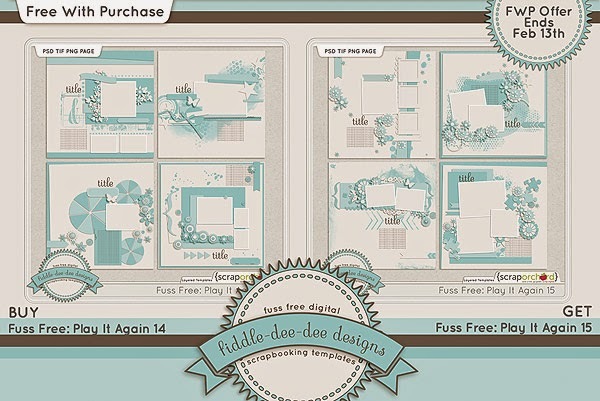 Fiddle-Dee-Dee Designs: Royale, Play It Again & Plan Ahead! 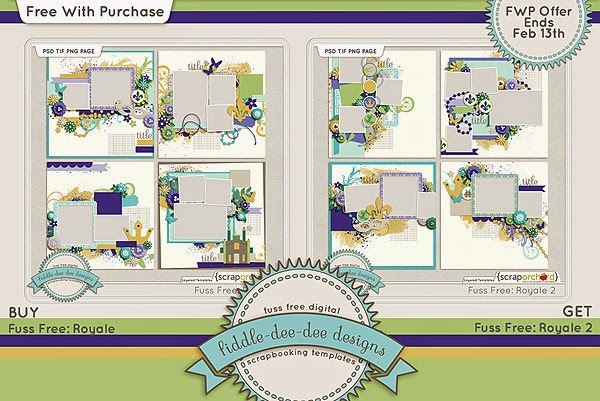 Fuss Free: Royale and Fuss Free: Royale 2 are sets of templates designed to coordinate with Royale by Dream Big Designs. Created with the Southern Belle in mind, these templates are a great way to document Mardi Gras parades and parties, princess photos, and magical events! Filled with a variety of photo shapes, leaves, flowers, scatters, frogs, alligators, masks, feathers, beads and more, each template helps you to create a layout perfect for the belle in your life! Fuss Free: Play It Again 14 and Fuss Free: Play It Again 15 are sets of templates that were formerly given away as freebies. Loaded with options from photo sizes to paper use and element layering, you'll find these templates are versatile enough to scrap a variety of moments in your life. Rotate, flip, minimize or maximize elements to make the template suit your needs. Instead of waiting until the end-of-the-year to frantically create calendar gifts for yourself and your family and friends, why not create your calendars month-by-month? Each month, I'll be bringing you a new template in various formats so you can scrap your calendars as you go throughout the year. This set provides loads of variety ~ the 12x12 template is great for creating a month-in-review layout for your scrapbook albums and the 4x6 (portrait and landscape) templates can also be modified to create brag books! Fuss Free: Plan Ahead ~ Feb 2016 is your ticket to begin stress-free personalized calendar creating . . . and so much more! Purchase Fuss Free: Royale and receive Fuss Free: Royale 2 for free! Offer valid through February 13, 2015. Purchase Fuss Free: Play It Again 14 and receive Fuss Free: Play It Again 15 for free! Offer valid through February 13, 2015. Thank you so much, Cheryl, for your generosity!